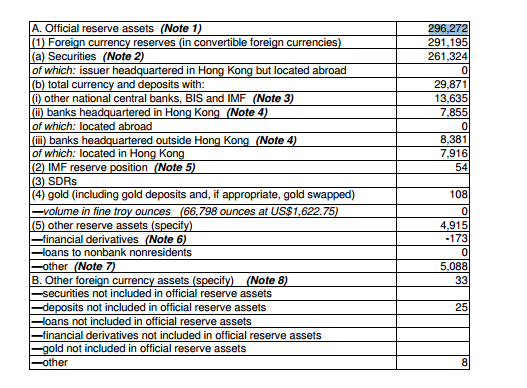 The Hong Kong Monetary Authority (HKMA) yesterday released full details of international reserves and foreign currency liquidity within its jurisdiction. The Far Eastern financial markets are a favorable destination for FX market participants, and certainly Hong Kong, Singapore and most of all Japan, are equally coveted within the retail FX sector. Hong Kong is a strategically important bridge to mainland China, as its trade policy is free and business can be conducted internationally, despite its incorporation within the communist-led China. Hong Kong’s financial market’s regulator produces full reports each month displaying liquidity and statistics detailing the amount of foreign reserves held, in accordance with the International Monetary Fund’s Special Data Dissemination Standard. At the end of June this year, $303,582 million in official reserve assets were held within the country’s financial system, compared to $299,896 at the end of July, representing a decrease of $3,686 million compared to the previous month, but up from the $296,272 million of July 2012. In spite of this month on month decrease in reserve assets, convertible foreign currency reserves reduced slightly less from $291,505 million to $291,139 million, but highly liquid, marketable equity and debt securities increased to $272,661 million from June’s $272,586 million. Financial Derivatives comprise the net marked-to-market value of forward foreign exchange contracts, swap contracts and options contracts, and the unsettled amounts of revaluation gains and losses for futures contracts, the reserve asset value of which increased to $267 million over June’s $260 million, whereas, other foreign currency which is not included within the reserve assets, comprises foreign currency deposits held in banks located in Hong Kong, and foreign currency assets held by the HKSAR Government increased substantially to $22,493 million compared to the previous month’s figure of $17,354 million. Whilst remaining a negative figure, June’s short term drains were minimal, with -$32 million nominal value upon maturity within one month, retaining the same nominal value at -$32 million with maturity between three months to one year. In by July, the net drain on short term currency assets had reduced to zero, but the nominal value upon maturity between 3 months to one year had an increased predetermined net drain of -$1314 million. Contingent liabilities have remained relatively stable, with -$855 million at the end of July, compared to -$850 million in June this year, and indeed very much in line with the -$853 million as of July 31 2012, one year previous.